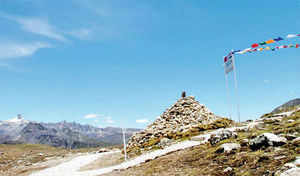 India-China border in Arunachal Pradesh. Beijing, Jan 20 : China has snubbed Japan's Foreign Minister Fumio Kishida for his statement acknowledging Arunachal Pradesh as part of India. The Chinese foreign ministry spokesman slammed Japan, asking it to mind its own business instead of interfering in India-China relationship. The Chinese reaction came after Kishida said that Japan was ready to invest in infrastructure projects in India's landlocked north-east, but it would not invest in Arunachal Pradesh, although it did see the state as part of India. Reacting to Japanese minister's statement, Chinese foreign ministry spokesman Hong Lei said, "We are seriously concerned about this and have lodged serious representation with the Japanese side. We hope Japan can fully understand the sensitivity of China-India border issues and respect the efforts that both sides have taken to resolve the disputes through negotiations." Hong said that Japan should be "prudent in its words and actions" and added that China and India are trying to resolve the boundary question in a manner that is fair, reasonable and acceptable to both sides. The spokesman pointed out that Japan had earlier said that it holds no position and it will not intervene in the boundary dispute between China and India. He said Japan should now clarify on the recent statement and 'remove the negative implications' arising from it. Pointing out that China claims ownership of Arunachal, Hong said the state includes "three areas in Tibet Autonomous Region - Monyul, Loyul and Lower Tsayul - currently under Indian illegal occupation". China regards the Mcmahon Line as illegal and claims areas in north-east along the line as Chinese territory.